Let me admit it - I have sat on the fence for far too long! Through meetings and discussions both inside and outside the church I have listened intently to both sides of the homosexuality debate. At no time however have I stuck my colours to the mast and made a stand - shame on me! Today however I am angered and moved to action. A Methodist minister who is openly lesbian was married in a legal ceremony some weeks back. Her senior colleague (Superintendent Minister in MCSA parlance) was offended by this and reported her for being in breach of the Laws and Disciplines of the MCSA. She is now required to appear before a disciplinary committee on 12 January. The topic of homosexuality has been one of intense debate in the Methodist Church of Southern Africa for some time now. It would seem that they are open to having gay and lesbian congregants and clergy as long as they don't legally recognise their mutual love in a marriage ceremony. It would seem that subterfuge is the preferred course of action. Would the MCSA rather have their homosexual clergy conduct their relationships in a clandestine affair? I strongly believe that the MCSA is a Church in crisis. Despite claims to the contrary, it is a divided church. Issues of class, race, economics, tradition and homosexuality provoke intense discussion amongst those in leadership and those in local congregations. However the Church leadership appears loathe to take a stand on those things which really matter. The minister in question was brave enough to be public about her sexuality and her commitment to her partner. She now finds herself appearing before a committee of people who bring their own thoughts and prejudices to bear on what is an intensely personal decision. On what will the disciplinary committee base its decision? This minister serves her congregation well and is respected by those who know her. Should she be found guilty of being in breach of Church discipline, what will she be expected to do? Will she be asked to divorce her partner? Will she be taken away from her congregation who know and love her and who depend on her for spiritual growth and leading? I will be watching with interest! So where then do I stand on this issue? Let me state it clearly - I have no problem with homosexual clergy. However I do not pretend to understand homosexuality. I do not know whether one chooses homosexuality or whether one is born a homosexual. 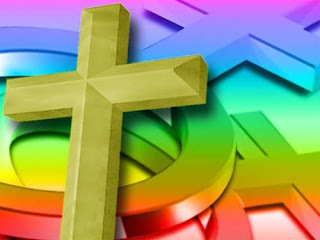 What I do know however is that an institution that professes to be accepting of all and the voice of those who society oppresses, needs to show love and acceptance to those within its ranks who continue to serve the people of God despite a sexuality which the majority of its leadership do not understand. I would welcome comment from those far more versed in the MCSA doctrines and disciplines. This post is simply a reflection of my personal thoughts and ideas at this time. These may come thick and fast but it certainly encourages one to find the original videos on YouTube! I will most certainly be going to watch this movie featuring Morgan Freeman and Matt Damon. I well remember the Rugby World Cup 1995. I was fortunate enough to be able to attend the opening game at Newlands in Cape Town and even today I am moved by the memory of that emotional outpouring of patriotism amongst the throngs of people present in the stadium. I can still hear the crowd shouting "Nelson, Nelson" as President Mandela walked out to greet the crowds during the opening ceremony. As the national anthem was sung, I remember turning to my right and seeing a white middle-age man crying as the emotion of the moment overwhelmed him. I do not know if it is possible for those who are not South African to understand that the story portrayed in this movie is not just about a "good story" - it is a much deeper and emotional tale that speaks to the very heart of what it means to be South African in this era of change, uncertainty, challenge and opportunity. Go and watch this movie and be reminded that sport unites and that we can stand proudly together as brothers and sisters in a beautiful country that more than ever needs unity and Umoja - a spirit of togetherness. Thanks to Brian Ibbott of Coverville for this video of an acappella choir from Slovenia giving a rendition of Toto's Africa which is absolutely awesome. The simulation of a rainstorm using their bodies is truly amazing. I suggest listening to the track with your eyes closed before watching it again to see the visual impact. Their YouTube video of this item has, at the time of writing this post, reached over 1,1 million views! They have several other videos on YouTube for your enjoyment.